Whenever a business routinely performs the same task or service repeatedly, forms can save employees and customers valuable time by streamlining information collection and processing. Custom forms also keep your operation running smoothly by organizing and storing the important information you need to run your business. We use paper made in the U.S.A. – typically using more substantial 20 pound stock – to eliminate tears & wrinkling. We can print one part padded forms in plain black ink – or one, multiple or full color – to give your forms a professional look that makes your business stand out from the crowd. We can use your existing PDF or Word file to print your forms. Or, our knowledgeable and experienced graphic design team can create a new layout and design that meets your unique needs. Of course, you can choose to see a PDF proof before printing! We’ll assist you every step of the way, from content development and layout & design – to the final delivery of your completed project. 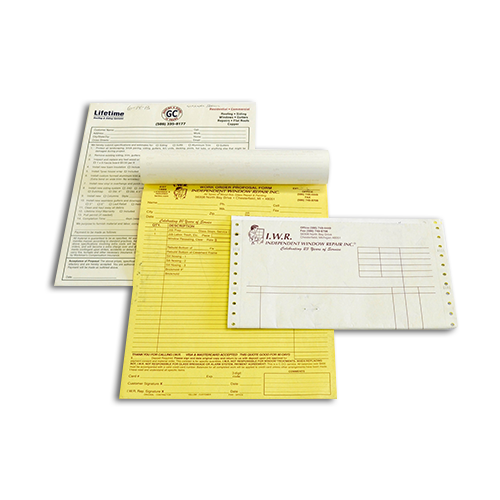 Improve work-flow, streamline transactions and improve operations with custom printed one part padded forms that do exactly what you need them to do!